Little Lilly didn't have the happiest beginning to her life and, sadly, her story is very common in rural areas of Virginia. She was bred to be and used as a hunting dog when she was young. Lilly didn't care for hunting much, so she was given away by her first owner. Then, while she wasn't used for hunting in her second home, she was relegated to the outdoors to live in a 'beagle hutch.' If you haven't seen one, it is very similar to a rabbit hutch. That's no way for a beloved companion to live her life. In the fullness of time, her second owner passed away and Lilly came to our grantee Highland County Humane Society for placement into a forever home. She was in pretty good health for her age--just needed a tune-up, which she got thanks to a Grey Muzzle grant--but due to her age and lack of socialization, staff thought it would take a little extra oomph to find her the perfect home. Lilly is the tiniest little girl, weighing only 13 pounds! As you can imagine, she is very shy with people util she gets to know them. She is submissive toward dogs and does well with dogs who are calm. While this ten-year-old gal is starting to slow down a bit, she still follows her nose like a true beagle. 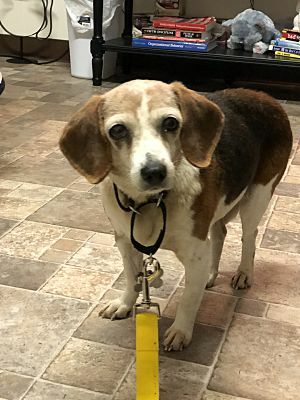 We're happy to report that during the holiday season, her beagle nose led her to a happy forever family with lots of soft dog beds and plenty of snacks. Thanks for giving Lilly the third chance she needed to spend her golden years with people who truly care for her.